Adults 25 years or older, who have a diagnosis of Autism spectrum condition or Asperger’s syndrome (and/or their main carers) who interested in taking part in the study should contact Dr Foley at autismcrc@unsw.edu.au or (02) 9385 0620. Australians who live in towns of less than 1,000 residents or rural locations have significantly higher levels of life satisfaction than those living in major cities, according to Australia’s most comprehensive household survey. The Household, Income and Labour Dynamics in Australia (HILDA) Survey undertaken by the University of Melbourne found that the kind of community a person lives in, impacts their happiness significantly. Having neighbours who help out and homes and gardens in good condition adds to a person’s life satisfaction. According to report author, Associate Professor Roger Wilkins, from the University’s Melbourne Institute, the category of people in Australia that rated the highest life satisfaction were women who lived in Queensland. “The report examines what makes Australians happy and healthy. It is vital tool for researchers and policymakers who examine and construct the social and economic direction for Australia,” said Associate Professor Wilkins. • Major cities offer least life satisfaction. • Living with a partner increases men’s health, but not women’s. • Towns smaller than 1,000 people and non-urban areas increase life satisfaction the most, closely followed by urban areas outside major cities. • Neighbors helping out and doing things together have large positive effects on life satisfaction. • Those who lived in wealthier areas report higher levels of life satisfaction. • Having a child significantly reduces likelihood of women re-entering the workforce but has no impact on men’s employment. • Changing employer is the best way to improve earnings growth. • The gender pay gap is increasing for part time workers. • Australians over 50 are the least likely to re-enter the workforce. • Time spent on welfare benefits is longer for those who commence on unemployment benefits than for those who commence on parenting payments. • Men and women in de facto relationships are, on average, more satisfied with their partners. • The longer the duration of the relationship, the lower the satisfaction (except after 20 or more years of marriage). • Kids make us less happy in relationships. • On average, men are more satisfied with their partners than women. • Children who moved out of the parental home at 21-24 years had an optimal outcome in terms of income and wealth in later adulthood. The situation is significantly worse for those who move out before the age of 18 and to a lesser extent 18-20 or over 25. • Having an employed mother while a daughter is 14 years of age means she is more likely to have a higher income later in life, however, for a son this doesn’t make any difference. • People who identify as lesbian, gay or bisexual (LGB) on average have poorer health and are less happy than people who identify as heterosexual. • Gay and bisexual men feel less safe than heterosexual men. • Smoking rates are much higher in LGB people – 33.8% of males and 26.8% of females – compared to 19.8% and 14.1% for heterosexual males and females respectively. The HILDA Survey has been running since 2001, and approximately 17,000 Australians are interviewed yearly on issues from housework and income to health and happiness. “The HILDA Survey helps to shine a light on changing trends in the Australian community and economy,” said Associate Professor Wilkins. The HILDA Survey was initiated, and is funded, by the Australian Government through the Department of Social Services. July 14, 2015 - Recent research has warned of the health detriments associated with sitting for long stretches of time at the office, but what about the nearly half of all employees worldwide who are required to stand for more than 75% of their workdays? Prolonged standing is associated with short-term adverse health issues, including reports of fatigue, leg cramps, and backaches, which can affect job performance and cause significant discomfort. A new study published in Human Factors suggests that, over time, this type of sustained muscle fatigue can result in serious health consequences. "The work-related musculoskeletal implications that can be caused by prolonged standing are a burden not only for workers but also for companies and society," notes María Gabriela García, a PhD candidate in the Department of Health Sciences and Technology at ETH Zürich. "Long-term muscle fatigue caused by standing for long periods of time has not received much attention." In "Long-Term Muscle Fatigue After Standing Work," García and fellow human factors/ergonomics researchers Bernard Martin and Thomas Läubli asked participants of two age groups to simulate standing work for five-hour periods. Participants could take brief seated rest breaks and a 30-minute lunch. The authors found evidence of significant long-term fatigue following the five-hour workday, even when it included regular breaks, and that adverse symptoms persisted for at least 30 minutes following a seated recovery period. Moreover, young adults ages 18 to 30 were just as likely to experience long-term fatigue as were workers over the age of 50. "Long-term fatigue after prolonged standing work may be present without being perceived," continued García. "Current work schedules for standing work may not be adequate for preventing fatigue accumulation, and this long-lasting muscle fatigue may contribute to musculoskeletal disorders and back pain." July 12, 2015 - When two different sized galaxies smash together, the larger galaxy stops the smaller one making new stars, according to a study of more than 20,000 merging galaxies. The research, published today, also found that when two galaxies of the same size collide, both galaxies produce stars at a much faster rate. Astrophysicist Luke Davies, from The University of Western Australia node of the International Centre for Radio Astronomy Research (ICRAR), says our nearest major galactic neighbour, Andromeda, is hurtling on a collision course with the Milky Way at about 400,000 kilometres per hour. "Don't panic yet, the two won't smash into each other for another four billion years or so," he says. "But investigating such cosmic collisions lets us better understand how galaxies grow and evolve." Previously, astronomers thought that when two galaxies smash into each other their gas clouds--where stars are born--get churned up and seed the birth of new stars much faster than if they remained separate. However Dr Davies' research, using the Galaxy and Mass Assembly (GAMA) survey observed using the Anglo-Australian Telescope in regional New South Wales, suggests this idea is too simplistic. He says whether a galaxy forms stars more rapidly in a collision, or forms any new stars at all, depends on if it is the big guy or the little guy in this galactic car crash. "When two galaxies of similar mass collide, they both increase their stellar birth rate," Dr Davies says. "However when one galaxy significantly outweighs the other, we have found that star formation rates are affected for both, just in different ways. 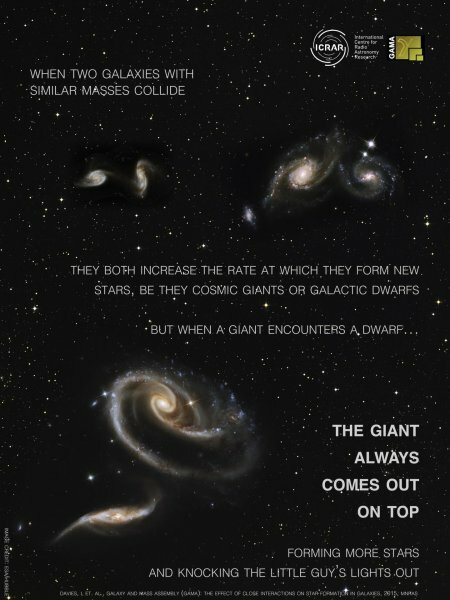 "The more massive galaxy begins rapidly forming new stars, whereas the smaller galaxy suddenly struggles to make any at all. "This might be because the bigger galaxy strips away its smaller companion's gas, leaving it without star-forming fuel or because it stops the smaller galaxy obtaining the new gas required to form more stars." The study was released today in the journal Monthly Notices of the Royal Astronomical Society, published by Oxford University Press. So what will happen in four billion years to the Milky Way and Andromeda? Dr Davies says the pair are like "cosmic tanks"--both relatively large and with similar mass. "As they get closer together they will begin to affect each other's star formation, and will continue to do so until they eventually merge to become a new galaxy, which some call 'Milkdromeda'," he says. Minister for Primary Industries, Niall Blair, has welcomed the release of a series of draft recommendations, which outline proposed changes to ensure the long-term sustainability and viability of the commercial fishing industry in NSW. The independent Structural Adjustment Review Committee (SARC) is writing to all commercial fishing businesses in NSW, with each fisher receiving the draft recommendations that relate to their business. “This state needs a commercial fishing sector that is viable and sustainable long in to the future. Doing nothing is not an option, which is why the NSW Government will make the necessary reforms to secure the future of this industry,” Mr Blair said. “This reform is about providing greater certainty and security to the commercial fishing industry – something this sector deserves. All commercial fishers are encouraged to examine the materials they receive from the SARC, and to use this next period of consultation to provide constructive feedback to assist the committee with finalising its recommendations. The SARC has considered extensive stakeholder feedback and will now consult further with the commercial fishing industry on its draft recommendations. The SARC has recommended modifying the $16 million adjustment program, removing a number of high impact options from consideration and giving commercial fishers more time to adjust to the changes. Environment Minister Mark Speakman has announced a round of changes that will transform the Royal Botanic Gardens and Domain Trust into a more efficient and responsive organisation. The changes follow the operational integration of the Botanic Gardens with the Centennial Park and Moore Park Trust, which already has resulted in more customer focused organisations. Mr Speakman made the announcement as he revealed the name of the Royal Botanic Garden’s planned architectural centrepiece, which will become a world leading horticultural display centre when opened next year. Mr Speakman said The Calyx in the Royal Botanic Garden would set a new benchmark for the public display of horticulture and would provide a stunning new education and interpretation facility for Sydney. The word “Calyx” refers to the sepals of a flower collectively, forming the outer floral envelope that protects the developing flower bud. The Calyx, which replaces the now demolished horticultural display centre, will open next year as the centrepiece of the Botanic Gardens’ 200th anniversary. Mr Speakman said while the announced organisational changes would transform the Botanic Gardens, the government remained committed to ensuring that science, education and horticulture continued to be central to the Botanic Gardens. 1. To transform the organisation into a world-class scientific institution, creating engaging and relevant science and horticulture for the community. 2. To create a sustainable organisation – environmentally, socially and financially – capable of on-time delivery of projects at value-for-money to the taxpayer. 3. To build new capabilities and services that do not currently exist in areas such as tree management, science communication, education and visitor services. The Australian Government will secure the future of 20 of our threatened bird species by 2020, setting an ambitious new target to reverse declines in their populations. We have to work harder to meet these challenges. We also have to work smarter. So, for the first time, an Australian Government has identified a list of bird species for priority action and committed to improving their fortunes within five years. I want to bring these birds back far enough from the brink to survive in the wild long-term. I want future generations to enjoy the colour, movement and song they bring to our lives. The first 10 birds identified for priority action are: the helmeted honeyeater, hooded plover, eastern bristlebird, regent honeyeater, mallee emu-wren, plains-wanderer, night parrot, Alligator Rivers yellow chat, and Norfolk Island's green parrot and boobook owl. Two more – the orange-bellied parrot and western ground parrot – will benefit from emergency interventions. The remaining eight species to receive special attention will be identified over the next 12 months, in consultation with the community. It is a pleasure to be able to make this significant announcement at the launch of the Birdlife Australia report in Melbourne today. The report's findings highlight the threats facing our birds, ranging from habitat loss and fragmentation to feral cats and foxes. It's not enough to add birds to our national threatened species list and plan to save them. We have to go one step further, by putting those plans into action. At the Threatened Species Summit in Melbourne tomorrow, I will release Australia's first national strategy for threatened species. It will clearly set out what will happen by when, turning good intentions into clear and measurable targets. The recovery of 20 bird species by 2020 is one such target. As a down payment on this target, I am pleased to announce funding for New South Wales Government projects that will help two of our priority bird species: the plains-wanderer and hooded plover, both listed nationally as vulnerable. We will contribute $100,000 to one project to tackle the 90 per cent decline in plains-wanderer numbers since 2001. It will control the rabbits and weeds that are degrading the plains-wanderer's grassland home in the Riverina and establish an insurance population for this rare species - the sole member of a family of birds found only in eastern Australia. We will also put $40,000 towards the study of two subpopulations of the hooded plover on NSW's south coast. By banding the shorebirds, tracking their movements and analysing their genetics, the project will help us better understand how the groups interact and how to conserve them. The latest announcements are in addition to the $525,000 committed last month to the orange-bellied parrot, in response to the discovery of beak and feather disease in the wild population of this critically endangered bird. It is possible to recover birds at risk of extinction because we have access to high quality science and can act in partnership with the community and other governments. Implementing evidence-based actions such as habitat restoration can support recovery of these birds and also protect the reptiles, frogs, insects and plants that share the same home. National Parks and Wildlife Service staff are excited after a positive sighting of an endangered Kultarr in Nombinnie Nature Reserve in Central Western NSW - the first time the marsupial had been seen in that area for 20 years. NPWS Ranger, David Egan was stunned to find clear images of the endangered marsupial on one of the reserve’s infrared cameras. “It is amazing to think that in over 270, 000 hectares of reserve, the camera captured one tiny Kultarr marsupial foraging its way through the reserve,” Mr Egan said. 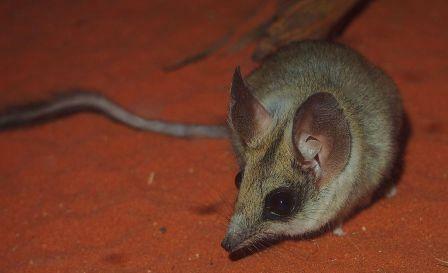 Listed as ‘endangered’ on the NSW Threatened Species Register, Kultarr’s are known for their large ears, long delicate legs and thin brushy tail. Comparable to the size of a large mouse, the Kultarr is an interesting creature that pivots on its front feet to change direction as it bounds rapidly through the scrub. Mr Egan said that the species’ small size and nocturnal qualities, rendered it notoriously difficult to track. “The installation of infrared cameras in the region have been instrumental to rediscovering threatened species in the Nombinnie Nature Reserve and have captured some great images of foraging Kultarr’s in the woodlands. “They have also picked up other small mammals such as Common Dunnarts and are proving a valuable resource for cataloguing fauna in such a large reserve,” Mr Egan said. “With solid evidence of the Kultarr’s existence in Nombinnie, we can now build this into research and data collection currently underway and develop strategies to best approach future conservation and management practices,” Mr Egan said. A targeted strategy for managing the Kultarr is currently being developed under the Saving Our Species program managed by the Office of Environment and Heritage (OEH). The public is encouraged to report any sightings of the species to staff at our NPWS Western Rivers Office in Griffith on (02) 6966 8100. July 16, 2015 - A new study of ocean temperature measurements shows that in recent years, extra heat from greenhouse gases has been trapped in the subsurface waters of the Pacific and Indian oceans, thus accounting for the slowdown in the global surface temperature increase observed during the past decade, researchers say. Co-authors are Josh Willis and William Patzert of NASA's Jet Propulsion Laboratory. What is the Regulation about? The Environmentally Hazardous Chemicals Act and the Environmentally Hazardous Chemicals Regulation regulate hazardous chemicals at various points throughout their life-cycle, from manufacture to use and disposal. The Act commenced in 1985 and has not undergone a fundamental review since that time despite the development of new industrial chemicals and chemical processes and technologies over the intervening years. The Environment Protection Authority (EPA) is undertaking a review of the environmentally hazardous chemicals legislation with a view to modernising it. A discussion paper has been prepared outlining proposed changes to the legislation. These changes seek to enhance the EPA’s ability to prevent adverse health and environmental impacts from hazardous chemicals as well as simplify some processes. The EPA welcomes comments from the community on the proposed changes. July 14, 2015 - James Cook University researchers in Australia are creating a buzz in bee research, gluing tiny transmitters to the backs of the insects for the first time. "We just had to hold them in our hands and hope the glue dried quickly. It was actually quite a process -- they had to be individually painted, then individually fed, then the tag glued on. Then individually scanned so we knew which tag was on what color and treatment bee and which hive it was going into. It all had to happen within about eight hours of emergence because as the day goes on they start learning how to fly and they get better at stinging." "No one had looked at bees at this level before, to see what individual bees do when they are sick," said Dr Lach. "We knew dead bees couldn't forage or pollinate," said Dr Lach. "But what we wanted to investigate was the behavior of live bees that are affected by non-lethal stressors." "The real implications from this work are for humans. 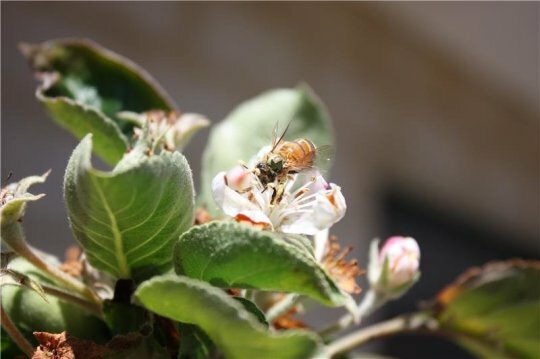 About a quarter of our food production is dependent on honey bee pollination. Declines in the ability of honey bees to pollinate will result in lower crop yields." SAVE THE LIVERPOOL PLAINS: It's YOUR problem too. This is the same mine that EDO NSW is representing Upper Mooki Landcare Inc in a current challenge to its approval by the NSW Government. A hearing has been set for 31 August to 3 September in the NSW Land and Environment. A proposal to make modifications to Mannering and Chain Valley collieries will be on exhibition from today for community feedback.  clear minor amounts of vegetation to protect infrastructure from bushfires. To make a submission or view the applications, visitwww.majorprojects.planning.nsw.gov.au. Submissions can be made from Wednesday 15 July 2015 until Thursday 6 August 2015. July 17, 2015 - In 2014, the most essential indicators of Earth's changing climate continued to reflect trends of a warming planet, with several markers such as rising land and ocean temperature, sea levels and greenhouse gases ─ setting new records. These key findings and others can be found in the State of the Climate in 2014report released online by the American Meteorological Society (AMS). The report, compiled by NOAA's Center for Weather and Climate at the National Centers for Environmental Information is based on contributions from 413 scientists from 58 countries around the world. It provides a detailed update on global climate indicators, notable weather events, and other data collected by environmental monitoring stations and instruments located on land, water, ice, and in space. "This report represents data from around the globe, from hundreds of scientists and gives us a picture of what happened in 2014. The variety of indicators shows us how our climate is changing, not just in temperature but from the depths of the oceans to the outer atmosphere," said Thomas R. Karl, L.H.D, Director, NOAA National Centers for Environmental Information. The report's climate indicators show patterns, changes and trends of the global climate system. Examples of the indicators include various types of greenhouse gases; temperatures throughout the atmosphere, ocean, and land; cloud cover; sea level; ocean salinity; sea ice extent; and snow cover. The indicators often reflect many thousands of measurements from multiple independent datasets. "This is the 25th report in this important annual series, as well as the 20th report that has been produced for publication in BAMS," said Keith Seitter, AMS Executive Director. "Over the years we have seen clearly the value of careful and consistent monitoring of our climate which allows us to document real changes occurring in the Earth's climate system." Record temperatures observed near the Earth's surface: Four independent global datasets showed that 2014 was the warmest year on record. The warmth was widespread across land areas. Europe experienced its warmest year on record, with more than 20 countries exceeding their previous records. Africa had above-average temperatures across most of the continent throughout 2014, Australia saw its third warmest year on record, Mexico had its warmest year on record, and Argentina and Uruguay each had their second warmest year on record. Eastern North America was the only major region to experience below-average annual temperatures. Sea surface temperatures were record high: The globally averaged sea surface temperature was the highest on record. The warmth was particularly notable in the North Pacific Ocean, where temperatures are in part likely driven by a transition of the Pacific decadal oscillation -- a recurring pattern of ocean-atmosphere climate variability centered in the region. Global upper ocean heat content was record high: Globally, upper ocean heat content reached a record high for the year, reflecting the continuing accumulation of thermal energy in the upper layer of the oceans. Oceans absorb over 90 percent of Earth's excess heat from greenhouse gas forcing. Pittwater YHA Envirofun Weekend August 28-30. Do something important and have fun too! PNHA assists with birding and botany activities. Eight years of Asparagus removal in Spotted Gum forest have transformed the bush. Go with friends, book through the hostel. Cost: $20 contribution for a weekend of great company, food and activities. Bookings Essential: $50 non-refundable booking fee with a $30 refund on arrival. The NSW Government today released a proposed amendment to the Mining SEPP, which would remove a provision making the significance of the resource the principle consideration under the Mining SEPP when determining mining projects. The State Environmental Planning Policy (Mining, Petroleum Production and Extractive Industries) 2007 is otherwise known as the Mining SEPP. Planning Minister Rob Stokes said the draft amendment reflects the legislative requirement for decision makers to consider the likely environmental, social and economic impacts of a mining development. To view the draft amendment and to make a submission, please visitwww.planning.nsw.gov.au/onexhibition. 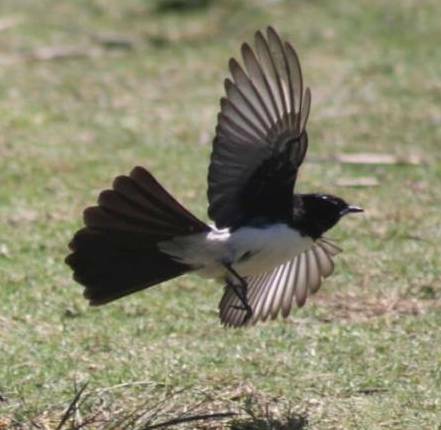 Willy Wagtail at Careel Bay - Picture BY A J Guesdon, 2011. The NSW Environment Protection Authority has detected further areas of coal fines in the Wollangambe River within the World Heritage Area of the Greater Blue Mountains National Park after an incident on 2 July 2015 at the Centennial Coal, Clarence Colliery mine site near Lithgow. EPA Director South Gary Whytcross said the EPA’s immediate priority has been on containment, clean-up and inspecting the river on the ground to determine the extent that the coal fines have moved downstream. “The incident has resulted in many tonnes of coal fines and course reject material, including coal rock, and gravel being dispersed into the environment surrounding the mine site,” Mr Whytcross said. “The EPA has inspected different sections of the Wollangambe River downstream of the spill and confirmed that coal fines have settled on the River bed and in pools from 1 to 4.5 kilometres downstream. Further investigations will be undertaken this week to inspect for coal fines in the rugged gorge area beyond the 4.5 kilometre point. “The EPA is working closely with the National Parks and Wildlife Service in undertaking this work and is also receiving expert scientific advice from the Office of Environment and Heritage about the environmental impact. “Ground inspections at an accessible point on the River near Mount Wilson, 14 kilometres downstream of the spill have confirmed that coal fines have not reached this far downstream. On 3 July 2015 the EPA issued Clarence Colliery Pty Ltd with a Clean Up Notice (No. 1531813) in relation to the spill. This Notice is publicly available via the public register on the EPA’s website. Mr Whytcross said the EPA has been monitoring compliance with the Clean-up Notice. “The company has installed twenty-two silt fences between the spill site and the Wollangambe River to prevent any further material reaching the River. The company is required to check and maintain the fences daily and remove any coal material to ensure it does not reach the River. The EPA is also continuing its legal investigation into the incident. The NSW Environment Protection Authority (EPA) is undertaking an investigation after an oil spill incident was detected on Tuesday 14 July 2015 in Rutherford Industrial Estate. EPA Manager Hunter Region, Adam Gilligan, said that at 9:00am on 14 July, while conducting an inspection of Stony Creek, Rutherford, an EPA officer observed a lagoon blanketed with a viscous, oily substance with a hydrocarbon odour. The oil slick covered an area of approximately 60m2. “Fire Rescue NSW (FRNSW) Hazmat unit was contacted and attended the site, and determined that the oil was contained within in the lagoon. FRNSW requested a waste contractor to remove the oil. Clean-up has commenced. The contractor has advised that clean-up should be completed tomorrow. “EPA officers have advised that no oil was found in Stony Creek upstream or downstream from the lagoon, and that the oil was localised in the lagoon. Samples have been collected, and the drains of nearby premises are being inspected.” said Mr Gilligan. EPA officers are currently seeking information from the nearby industries to determine whether the oil originated from their premises. This incident follows an oil spill in the area in August 2014. On that occasion, the source of the spill could not be identified. Significant resources from the EPA and FRNSW were involved in the clean-up and investigation of that incident. The area has also been the subject of complaints regarding odour, with 26 complaints received by the EPA during the last two weeks. The EPA is investigating these odour complaints. “It’s concerning to see this area again being the subject of a pollution incident. Industries and transporters operating in the area are on notice that the EPA will be deploying significant resources to the area in the weeks ahead to make sure that environmental requirements are being complied with. “Residents of Rutherford and surrounds deserve an environment that is respected and protected by local industries,“ Mr Gilligan said. Anyone with information about the incident is encouraged to contact Environment Line 131555. Concurrent proposals to modify Stages 1 and 2 of the Moolarben coal mine are on exhibition for community feedback. 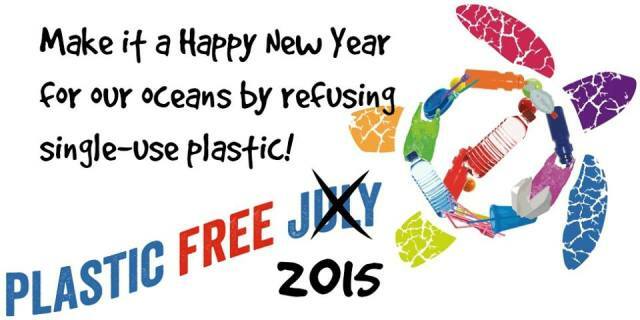  increase the approved production and transportation limits. “It’s easy to participate by going online and we encourage everyone to take a look and have their say. To make a submission or view the environmental assessment, visitwww.majorprojects.planning.nsw.gov.au. Submissions can be made from Friday 3 July 2015 until Friday 31 July 2015. Australia’s new ocean-going research vessel Investigator has discovered extinct volcanoes likely to be 50 million years old, about 250 km off the coast of Sydney in 4,900 m of water. While scientists were searching for the nursery grounds for larval lobsters, the ship was also routinely mapping the seafloor when the volcanoes were discovered. They haven’t been found before now, because the sonar on the previous Marine National Facility (MNF) research vessel, Southern Surveyor, could only map the sea floor to 3,000 m, which left half of Australia’s ocean territory out of reach. The centre of the volcanic cluster is 33 31 S, 153 52 E, which is 248 km from Sydney Heads. The cluster is 20 km long and six km wide and the seafloor 4890 metres deep, with the highest point in the cluster rising up to 3998 metres. July 13, 2015 – Australia's new ocean-going research vessel Investigator has discovered extinct volcanoes likely to be 50 million years old about 250 kilometres off the coast of Sydney. The chief scientist for the voyage, UNSW Australia marine biologist Professor Iain Suthers, said the volcanoes were discovered in 4,900 meters of water during a search for nursery grounds for larval lobsters. At the same time the ship was also routinely mapping the seafloor. The above is reprinted from materials provided by University of New South Wales. The original item was written by Deborah Smith. A major new investment begins today in NSW public primary schools, which will enable more than 1,000 of the best teachers to mentor and coach other teachers, improving the results of students. NSW Premier Mike Baird, Minister for Education Adrian Piccoli and Lane Cove MP Anthony Roberts today met some of the first students and teachers who will benefit from the $224 million Quality Teaching, Successful Students package during a visit to Ryde East Public School. “As teachers and students return to school for term three I’m proud to be delivering on this key election commitment. As we improve the skills of our teachers, we will help students achieve better results,” Mr Baird said. • Collaborate within their school and with colleagues in other schools. “The $224 million will provide additional staffing so that selected experienced teachers can take up these important leadership roles across their schools. "The DSP payments cost taxpayers $17 billion annually and this measure will provide an additional level of assurance to the DSP claim process. "The Abbott Government is committed to getting our welfare budget under control, by reigning in the expansion of the welfare system that occurred under previous Governments to ensure we have a sustainable safety net for the future," Minister Morrison said. 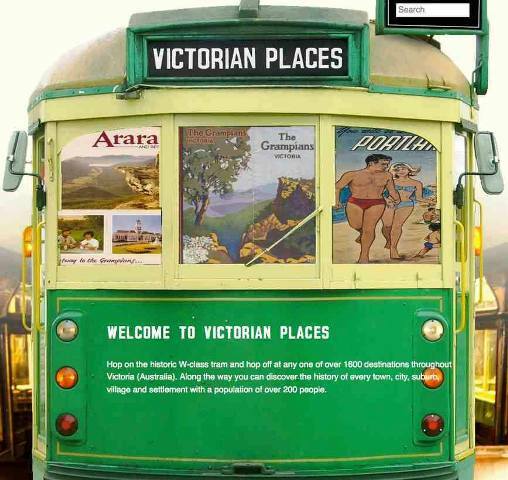 The State Library of Victoria (SLV) has launched a new website called 'Victorian Places'. It lists every town and suburb in Victoria and provides a history for each place with, photos, maps, excerpts from newspapers and current demographic information. It's similar to the Australian Dictionary of Biography (ADB) for towns and suburbs. It will certainly come in handy in the heritage sector and for researchers working on place based projects. 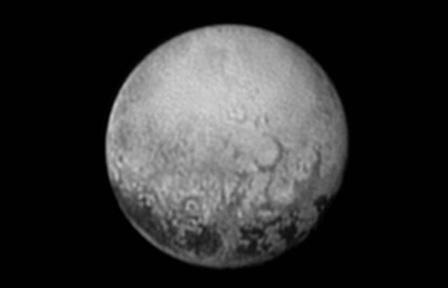 After nine-and-a-half years and just over five billion kilometres, the much anticipated and incredibly long awaited close-up view of Pluto is only hours away. NASA's spacecraft New Horizons will make its closest encounter with Pluto at exactly 9:49.57pm (AEST) today [14 July 2015]. CSIRO's Canberra Deep Space Communication Complex (CDSCC) will be the first place on Earth to receive the closest encounter images as it's sent through from the space probe. The world will see for the first time what Pluto actually looks like as the spacecraft flies 12,500 km above the surface, taking detailed measurements and images of the dwarf planet and its moons. CDSCC is part of NASA's Deep Space Network and is one of only three tracking stations in the world that has the technology and people with the capabilities to provide the vital two-way radio contact with spacecraft like New Horizons at such incredible distances from Earth. "We have tracked New Horizons since its launch in January 2006 and are currently receiving the latest images and telemetry from the spacecraft which allows the mission team to make decisions about course corrections and to begin the key science observations," Director of the CDSCC Dr Ed Kruzins said. Radio signals from New Horizons will take about 4.5 hours to reach the CDSCC and are incredibly weak. However thanks to the big dish's high sensitivity on Earth at CDSCC , Pluto will come in loud and clear. There will be so much data collected it will take up to a year before all of the images and science observations made by the spacecraft are fully transmitted back to Earth. Head of CSIRO's Astronomy and Space Science, Dr Lewis Balls said the New Horizons mission was one of the great explorations of our time. 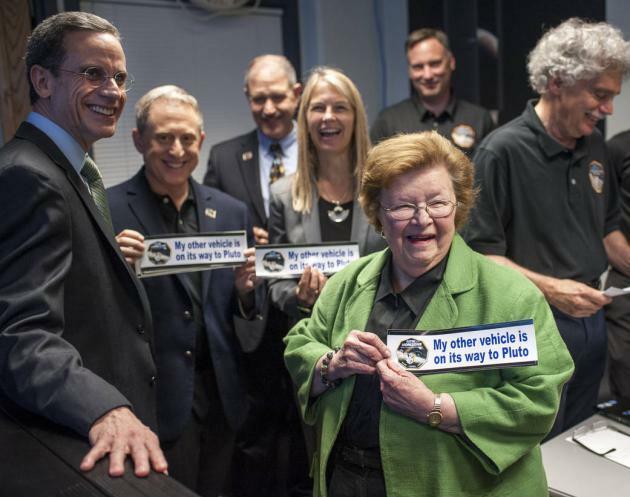 "There is so much we don't know and not just about Pluto, but also about similar worlds," Dr Ball said. "Reaching this part of our solar system has been a space science priority for years, because it holds building blocks of our solar system that have been stored in a deep freeze for billions of years." While Pluto was downgraded from a planet to a dwarf planet in 2006, it is thought to contain important clues about the origins of the Solar System. These icy bodies are thought to be relics of the materials that originally built up to become the larger planets. This will be the first time that scientists can study this process as it happens. "CDSCC has been involved in many of space exploration's greatest moments, from capturing images of the first moon walk to receiving amazing views from the surface of Mars, and the first 'close-ups' of Jupiter, Saturn, Uranus and Neptune," Dr Ball said. "Capturing Pluto will be the capstone of this amazing space adventure. "CSIRO is capturing space history in the making. We will be rewriting textbooks and science that will be taught in the classrooms of tomorrow." Below: Three billion miles from Earth and just two and a half million miles from Pluto, NASA’s New Horizons spacecraft has taken its best image of four dark spots that continue to captivate. Many of us lament the fact much of our day is spent inactive and that we are seated at work, in the car and at home watching TV. Researchers from the University of New England are looking for individuals who want to change their everyday sitting habits for healthier, more active alternatives. UNE’s Associate Professor John Malouffsays previous research shows that extensive sitting contributes to health problems and early death. Despite growing awareness of the risk and the detrimental effect on people’s health, many individuals have trouble changing their habit of sitting in everyday situations. “I used to have a two hour return commute to work, sit for hours a day at work, followed by hours sitting watching TV. I now live close enough to walk to work. I stand at work, including during parts of meetings. I also stand often when I eat and when I drink tea,” A/ Prof. Malouff said. Co-researcher, Katrina Kastanias, has also applied elements of the program to her own life at work and when using public transport. “Having learned practical ways to sit less, I am mindful to stand whenever I can,” Ms Kastanias said. The research team are hoping participants will experience a decrease in sedentary behaviour and that the study will contribute scientific understanding of how to motivate people to sit less in everyday life. The Australian Government will provide over $900,000 in support for one of Victoria's most recognisable National Heritage places – Rippon Lea House and Gardens. Rippon Lea House and Gardens is one of the 18 National Heritage places to receive project funding under the Australian Government's Protecting National Historic Sites programme. The Protecting National Historic Sites programme supports activities that protect, manage, maintain and conserve places listed on the National Heritage List for their historic values and contribute to the management and long-term sustainability of these places. The Rippon Lea House and Gardens project will create a new community heritage hub and bring to light previously untold stories of the place. The reinstatement of the workers entrance and the conservation of the house staff areas, garden, and stables will tell the story of those who worked behind the scenes of a 'great house'. Rippon Lea's stables, coach house, conservatory, orchards and kitchen gardens will also undergo work to create the infrastructure for a heritage community hub for artists, exhibitions and other community events. This new infrastructure will enable the National Trust of Australia (Victoria), the site's owner and manager, to build on the recent success of Miss Fisher's Murder Mysteries Costume Exhibition, to increase visitor numbers, and community engagement with this special place. I am delighted this project coincides with the National Trusts' 60th anniversary in Victoria. The Government recognises the vital role the National Trusts play across Australia in the promotion of our national heritage. Projects, including heritage festivals, Trust News publications, and educational programmes including public and interactive resources, are supported by the Australian Government through the National Trust Partnership Programme.